I was hoping to take a week off from work this month and explore Oregon more but I had to buy a new computer and that took all my spending money. I’ll just have to do that when I come back to the West Coast in the, not too distant, future. 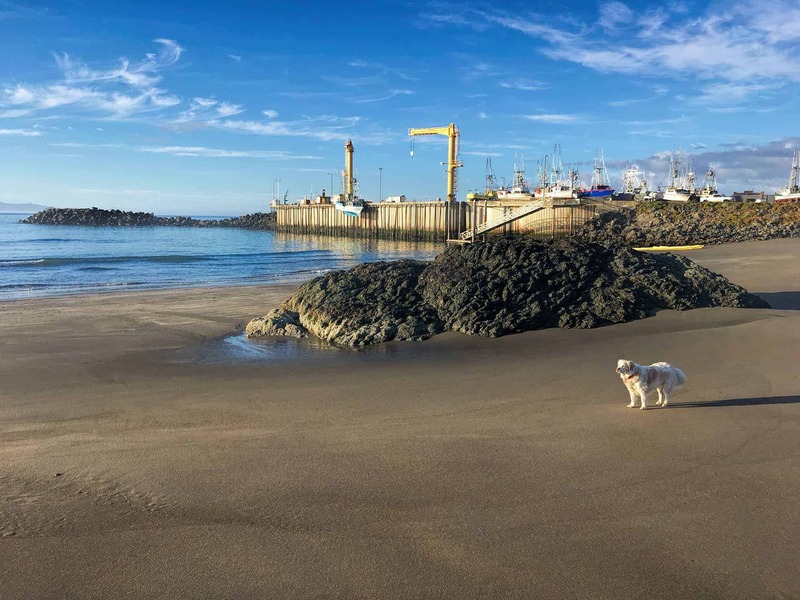 Here are just a few pictures taken at “Dog Beach” – near the port – home to the only “dolly dock” on the West Coast, where vessels are launched and retrieved using the cranes and they’re housed on homemade dollies when not fishing. 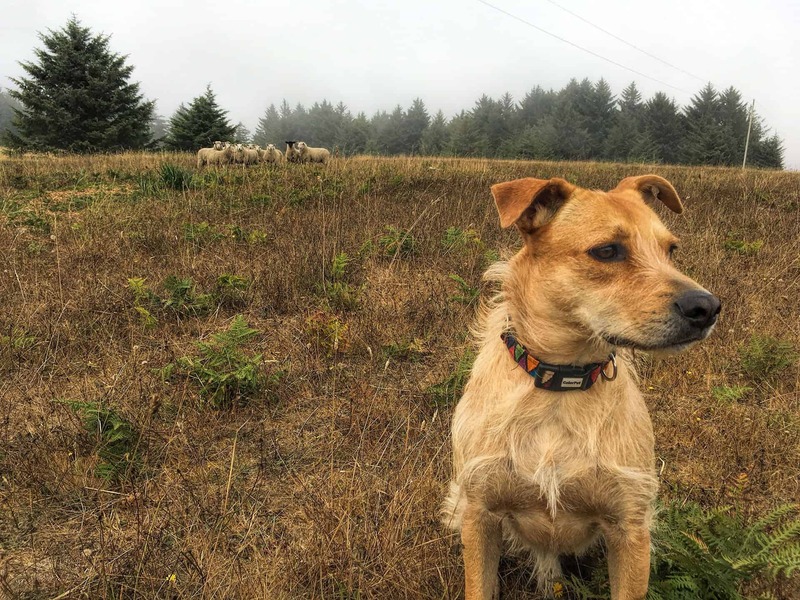 There’s also 1 of Teddy at Camp Blanco State Park hoping he can hide so he doesn’t have to leave and the other one is of him ignoring the sheep, but they’re certainly not ignoring him. 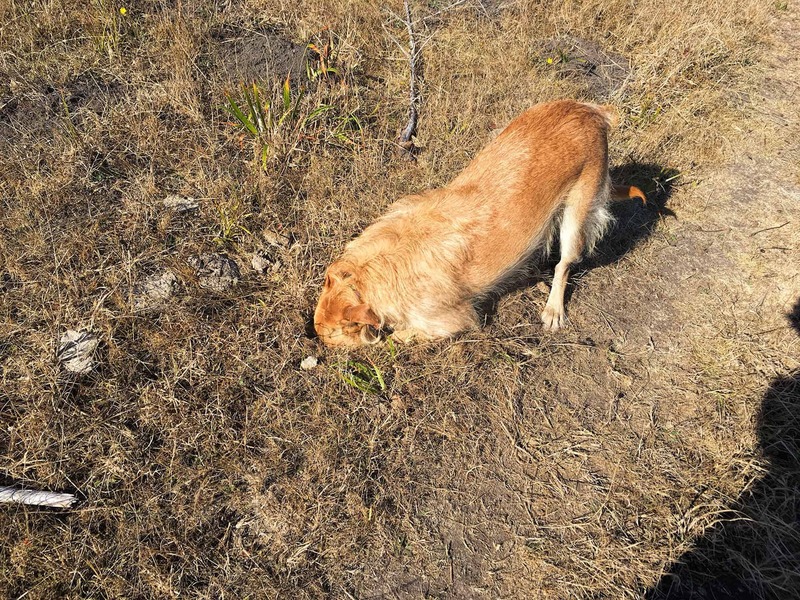 If you want to see something funny, watch this video of Teddy digging up a critter hole using more than just his paws. That’s my boy! This is Teddy’s friend Emmy Lou. sorry you have to leave so soon. looks like Ted had a great time and you worked. what a life of a dog. have a safe journey onwards to Tucson? we are going hiking to chaco canyons on monday. take care talk with you soon. be safe an happy travels. Teddy and I both really enjoyed our time here. I’m off to the White Mountains in Arizona until December then I’ll head down to Tucson. Trying to avoid as much of the heat as I can. lol. Enjoy Chaco! Hugs to you and Cisco. We desert dwellers are living vicariously through your glorious photographs of a “cool” in the hipster meaning Summer home. Ted has learned to use all his tools to excavate … he is a genius of course. Next week should drop into the high 80’s here followed by low eighties later in the week with lows in the high 50’s … say that 10x fast. We have a new terrier at Smiling Dog named Radley … reminds us a lot of Ted2. He will be moving to Memphis with his parents sometime in November to join other Air Force dogs. Otherwise not much new … Cooper has spent most of the Summer in Pinetop. Sassie hanging on but not visiting as often. Dexter, Duncan, Toby and RedTed all still part of the 3 o’clock club. Be safe! Happy travels! *laughs… it has been a really “cool” in the temperature meaning too. I’m looking forward to seeing you guys again when I get back in December! Teddy hasn’t had much “dog park” action but lots of dogs on the beach always made him happy. There’s a few he’d be so happy to see he’d just lick and lick and lick! lol Stay cool and give Ted1 a hug for me! Hi!!!! I’d like to think that Teddy learned a bit about correct use of all tools for digging from my Toby. It’s the terrier in him. Relentless. As Margaret said, the weather is finally cooling off. It’s been raining off and on all day. 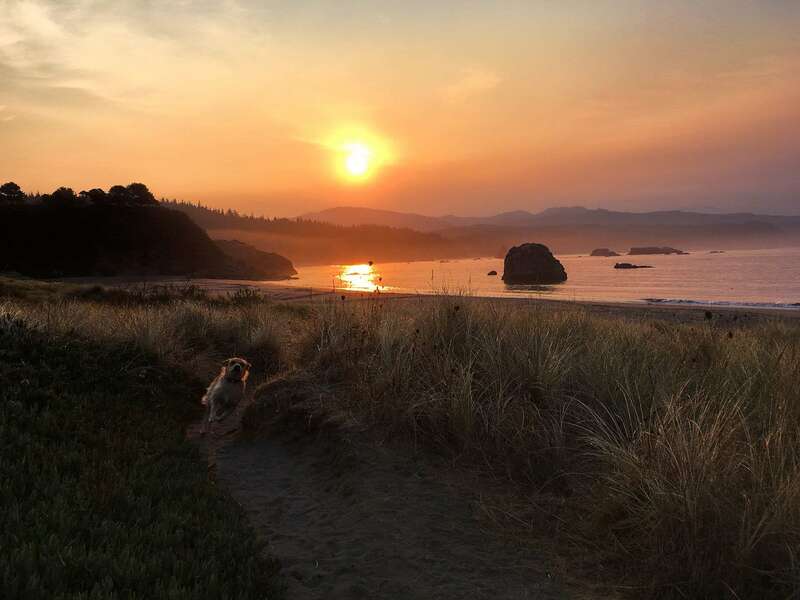 Delightful, though I understand wanting to leave the NW coast before the big rains and wind. 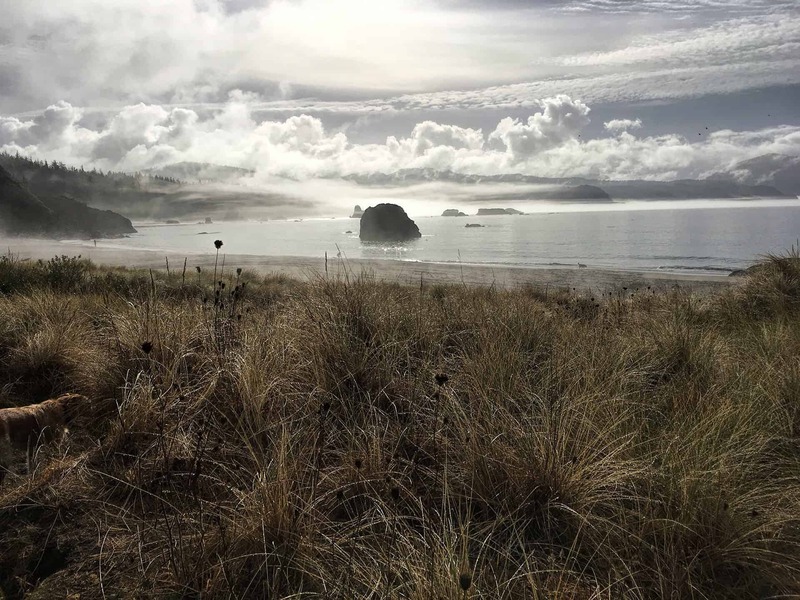 My sister recently spent a week on the Oregon coast and captured very similar photos as you have. What an amazing place. We are sorry you won’t get to meet Radley. He’s so like Ted2 – it makes us all miss you guys more. But December is soon, right? Even Cooper and his people are moving back down from Pinetop in a couple of weeks, so it must be truly fall. Drive carefully on your way to the White Mtns. I love that I get to see you and Ted even though you’re not here. I made it to my RV spot in Pinetop yesterday, where I’ll be for the next 2 months. Yep… the same Pinetop where Cooper and Sassie have been hanging! I would have liked to meet Radley too! I saw an article recently about a woman and 2 cairn terrier mixed dogs and Teddy looked so much alike them it was uncanny – even the same weight. I’m going to enjoy the non-humid cooler temps for now! Give hugs to Toby and Duncan for me!